Herbsmith Acute Trauma is a versatile blend that is perfect for addressing everything from occasional aches to discomfort caused by normal daily training and activity. 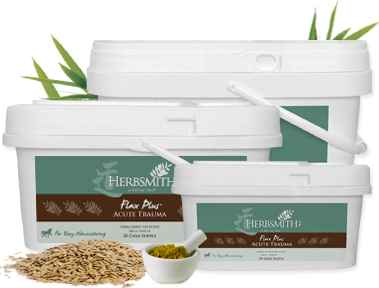 This collection of herbs, provided in their natural form, is gentle on the horse’s GI tract, so horses who are unable to tolerate other options can handle Flax Plus Acute Trauma. That’s the beauty of the Herbsmith Advantage! Herbsmith Flax Plus Acute Trauma is a combination of flax seed and herbs that quickly and successfully address the root cause of discomfort and the long term results that can occur from it. Still Have Questions About Flax Plus Acute Trauma?